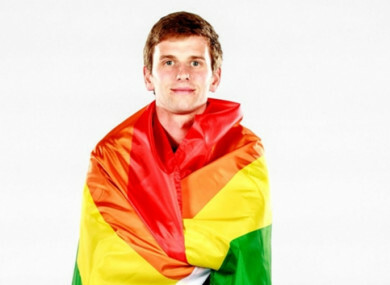 MINNESOTA UNITED MIDFIELDER Collin Martin publicly declared he is gay on Friday ahead of his team’s Pride celebrations. Martin, 23, began his MLS career with DC United as a teenager in 2013 and made 15 appearances for the team over four seasons. He was then traded to expansion side Minnesota in 2017, where he has played a bit-part role in the last two seasons. Now he is preparing to follow in the footsteps of Robbie Rogers in declaring his sexuality in public. “Tonight my team, Minnesota United, is having their Pride night. It’s an important night for me — I’ll be announcing that I am an openly gay player in Major League Soccer,” Martin wrote in a statement shared on Twitter. “I have been out as a gay man for many years to my family and friends, and this includes my team-mates. “Today I am proud that my entire team and management of Minnesota United know that I am gay. I have received only kindness and encouragement from everyone in Major League Soccer and that has made the decision to come out publicly that much easier. Minnesota are also supporting their player, with rainbow-colored numbers set to be used in Friday’s match against FC Dallas to mark Pride. Martin’s decision is a big step in the context of a sporting world that has had precious few individuals come out as gay. He will be the second to do so in MLS after the now-retired Rogers, while no active players in the NFL, NHL or MLB have had a similar experience. Only former New Jersey Nets basketball star Jason Collins has played in one of the United States’ other major four sports leagues after revealing his sexuality. In England, meanwhile, Justin Fashanu remains the sole openly gay professional to play in the First Division or Premier League. Former Aston Villa, Stuttgart and Germany star Thomas Hitzlsperger also came out as gay, albeit after hanging up his boots as a player. Email “MLS player Martin celebrates 'openly gay' identity on Minnesota United Pride night”. Feedback on “MLS player Martin celebrates 'openly gay' identity on Minnesota United Pride night”.